Houston Texans running back Lamar Miller made NFL history by running 97 yards for a touchdown (only the 4th player to do so), but then really cemented his place in the records as he also ran for 97 yards in 2014 when he played for the Miami Dolphins. He’s now the only NFL player to ever score multiple TD’s of over 93-yard runs. The Texan defense brought pressure all night and overwhelmed the Tennessee Titans for a big divisional win on Monday Night Football. Texans 34, Titans 17. 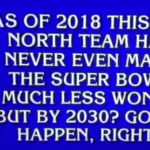 The Detroit Lions have long struggled in the NFL, and on Monday the popular game show Jeopardy used their struggles as one of the answers to a $600 category called, “Predictions by 2030”. The Answer was: “As of 2018 this NFC North team had never even made the Super Bowl, much less won it. But by 2030? Gotta happen, right?” The question was, “Who are the Detroit Lions”.